Redirecting to: www.famous-trials.com/jesustrial in (10) seconds. Pilate presenting Jesus to the crowd. 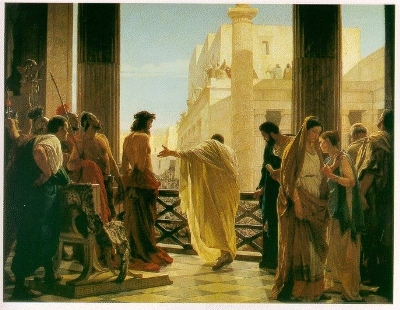 Ecce Homo, by Antonio Ciseri (1821-91). * It is possible, but less likely, that the trial of Jesus took place in 33 C.E. "C.E." stands for "Common Era"
(or "Christian Era")--30 C.E. is the same as A.D. 30.